Surah Al-Muzzammil: The Enshrouded One (Summary of 73rd Chapter of Holy Quran) ~ Islam My Ultimate Decision . Mid night prayer called "Tahajjad" is one of the most liked form of worship by Allah the Almighty and that is why in this Sūrat al-Muzzammil, the Prophet of Allah (peace be upon him) has been exclusively instructed to observe the mid night prayer regularly. Its importance is due to the fact that one has to break one's sleep at night, preferably after midnight, and offer Tahajjad prayer before the time for pre-dawn prayer commences. This chapter is seemingly been revealed in two portion: From verses 1-19, the peculiar short verses point towards revelation in Makkah. And more so for the reason, that the instruction for the mid night prayers point towards an early period of Islam when the Prophet Muhammad (peace be upon him) was still receiving instructions from Allah for self training and how to deal with the disbelievers. The verse 20 is a rather long verse, unlike those revealed in Makkah, and is considered to have been revealed in Medina for it talks about payment of Zakah, an obligatory charity which was enforced after establishment of an Islamic welfare state in Medina. Also it instructs the Prophet to fight in the name of Allah with those who harm Muslims or stand in their way to spread the word of truth. In first part (verses 1-7) the Prophet has been instructed to offer mid night prayer - a sort for conditioning to be prepared to lift the burden of prophet hood in days to come. 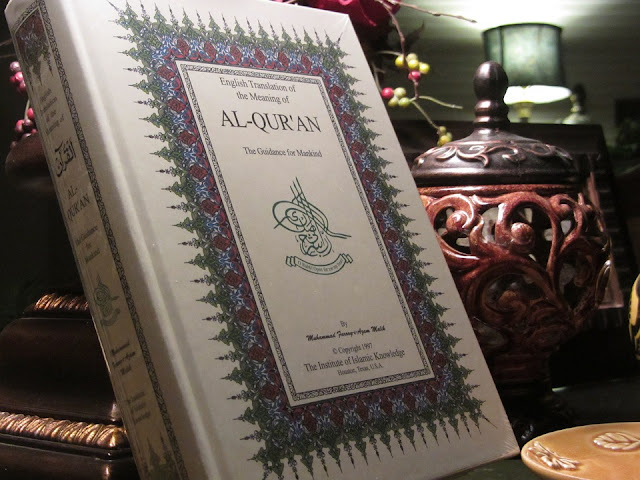 And recite Holy Quran at night (verses 8-14) for it is the best time to concentrate in solitude of night. Secondly, in verses 15-19, the Holy Prophet (upon whom be peace) has been exhorted to have patience at the excesses being committed by the disbelievers of Makkah, who have been threatened with the torment. The third part again stresses the Tahajjad, while the normal Muslims should particularly attend to the five times obligatory prayers a day:, besides they should discharge their zakat dues accurately; and spend their wealth with sincere intentions for the sake of Allah. 1. O you wrapped in garments (i.e. Prophet Muhammad (peace be upon him) )! 4. Or a little more; and recite the Qur'an (aloud) in a slow, (pleasant tone and) style . Here the Prophet has not been addressed by name, rather referred to wearing of the cloak which was usual of the Prophet which he wore during the day and wrapped around him when asleep at tight. The Prophet is thus instructed to break his night sleep after midnight and devote some time in offering Tahajjad prayers and reciting the Holy Quran in solitude - the best time to remember Allah and seek guidance. This also gives the message that "Gone is the time when you used to enjoy peaceful sleep at will; now you lie under the burden of a great mission, whose demands and duties are different as well as onerous." 9. (He Alone is) the Lord of the east and the west, NO ONE but HE has the right to be worshiped. So take Him Alone as Disposer of your affairs . 10. And be patient (O Muhammad(peace be upon him)) with what they say, and keep away from them in a good way. In verse 10, Allah stresses on the Prophet of Allah to avoid any confrontation with the pagans of Makkah, rather they be treated in a manner that they should not carry the impression that the Prophet has been arrogant or repulsive. for disbelievers it contains a strong message: "It is not due to any weakness on the part of the Prophet that he is not responding to what you are saying against him, but Allah Himself has taught His Messenger to adopt this noble way of conduct in response to your foolish behavior. " 11. And leave Me Alone to deal with the beliers (those who deny My Verses), and those who are in possession of good things of life. And give them respite for a little while. 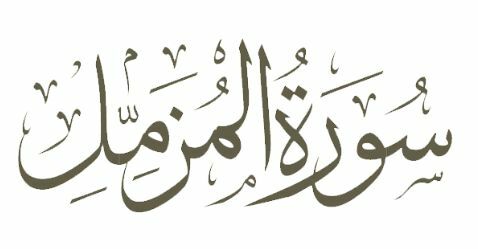 In the verses 8-15, the Oneness of Allah is stressed - and that He alone is to be worshiped for He alone is the disposer of all wordily affairs. As for the disbelievers and beliers, Allah takes upon Himself to deal with them for they have dared to deny Allah's verses and His Prophet. And when the end day comes, there will be blazing fire ready as food for those who pained Allah's Prophet and denied what He said. 15. Verily, We have sent to you (O men) a Messenger (Muhammad ) to be a witness over you, as We did send a Messenger [Musa (Moses)] to Fir'aun (Pharaoh) . 16. But Pharaoh disobeyed the Messenger [Musa (Moses)], so We seized him with a severe punishment. In the verses 15-19, the Prophet of Allah has been consoled and told that Allah is watching over Him, and would not forsake Him by giving the example the dreadful end of the Pharaoh, who while chasing the Prophet Musa (Moses, peace be upon him) drowned along with his mighty army of chariots he always boasted off, while Prophet Musa and the Israelites escaped to safety. There is a message here for the disbelievers too that when the End Day comes, they would have shared of hell for teasing the Prophet of Allah. "Verily, this is an admonition, therefore whosoever will, let him take a Path to His Lord!" 20. Indeed, your Lord knows, [O Muhammad (peace be upon him)], that you stand [in prayer] almost two thirds of the night or half of it or a third of it, and [so do] a group of those with you. And Allah determines [the extent of] the night and the day. He has known that you [Muslims] will not be able to do it and has turned to you in forgiveness, so recite what is easy [for you] of the Qur'an. He has known that there will be among you those who are ill and others traveling throughout the land seeking [something] of the bounty of Allah and others fighting for the cause of Allah . So recite what is easy from it and establish prayer and give zakah and loan Allah a goodly loan. And whatever good you put forward for yourselves - you will find it with Allah . It is better and greater in reward. And seek forgiveness of Allah . Indeed, Allah is Forgiving and Merciful. In this verse, stressing on the mid night prayers, Allah does not lays down strict commandments about the length of the Tahajjad prayers so that those in travel or fighting in the name of Allah may not have to undergo additional burden.